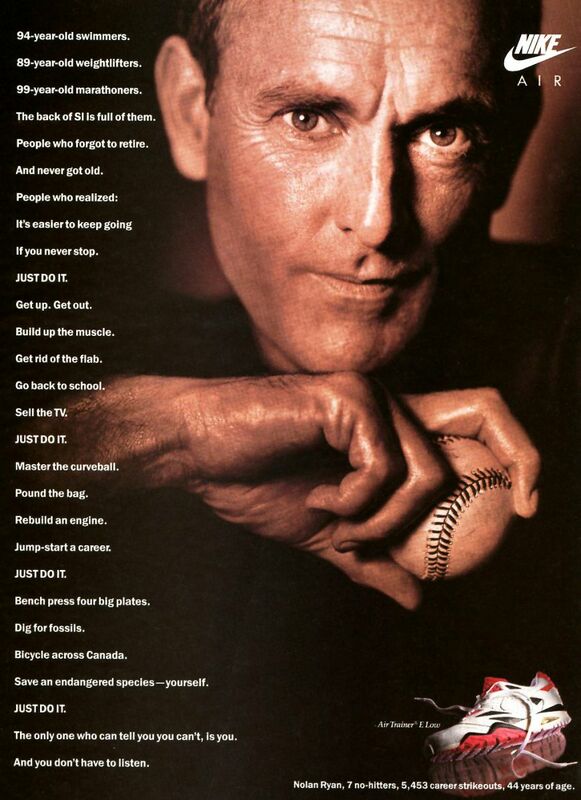 Baseball is back and today we'll take a look at a Nike ad featuring one of the greatest pitchers of all time. If your number is retired by three different teams you played for, you're probably doing something right. Nolan Ryan was an absolute beast on the pitcher's mound. With a MLB record 27 seasons, Ryan also has the record for most no hitters (7) and strikeouts (5,714). Today's Vintage Ad features Nolan with some inspirational words for the older generation, who he was a fitting poster boy for since he was still throwing over 95 mph pitches into his forties (44 at the time of this ad). As for the shoe, we see the Nike Air Trainer E Low. The E Trainer released in 1991 and was available in both a low and high. It seems to be the very close relative of Bo Jackson's Air Trainer SC, with almost the same silhouette, heel Air unit, and outsole. We may never see another pitcher like Nolan Ryan, and because it's a somewhat obscure Nike Training model, we may never see the Air Trainer E again, either. I wish baseball fans good luck for their team in the 2012 MLB season (unless you're a Yankees fan), and to Nike Training fans, good luck finding a pair of these shoes!